E-cigarettes are electronic, so they contain both nonrenewable metals and chemicals that are toxic to landfills. Find out how to dispose of e-cigarettes here. 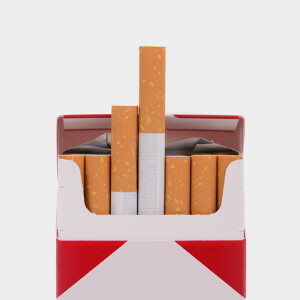 Cigarette packs are paperboard and can be recycled with other paper products. Just make sure the outer plastic and inner foil packaging has been removed first. Cigarette waste leaches dangerous toxins when in contact with soil or water and kills bacteria needed for the composting process. You can ship your cigarette waste for free to the Cigarette Waste Recycling Program. This program recycles every part of the cigarette and its packaging except for the paper box, since it can be recycled locally. Mail in your used cigarettes, packaging and ash with a free shipping label. Portable ashtrays prevent cigarette litter. There are many stylish ways to put your butts out on-the-go. Check out Etsy and ButtsOut. TerraCycle, a private business based in New Jersey, has developed a program to collect cigarette butts and process them into plastics. Learn more about how butts are turned into a useful material. Many people believe that it’s socially acceptable to throw cigarette butts on the ground. So consequently, cigarettes have become the most common type of litter on the planet—over 30 percent of all litter. That’s about 1.5 billion pounds of cigarette butts each year.